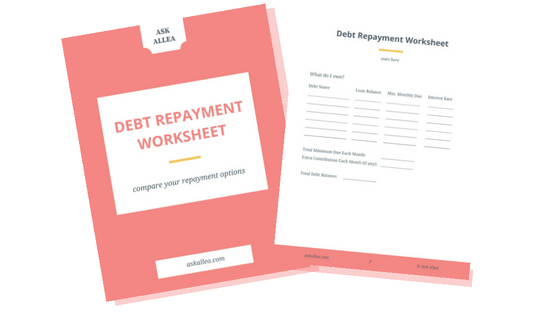 And, being the type to share all sorts of good things, I'm going to share with you my number one favorite debt repayment calculator on the interwebs (plus honorable mentions below). Do you have a car loan (or two)? Do you have student loans? Who are your servicers? Do you have a credit card balance that you’re rolling over from month to month? What is your balance for each loan or credit card? What is your interest rate for each? What are your minimum monthly payments for each? What are your actual monthly payments for each? Are you paying the minimum monthly payment or are you paying more than that? This information should all be available to you online, through your bank, credit card company and student loan servicers. You’ll have to go look for it, but it should be there. Step one in paying off debt is to know what debt you have, how much interest it’s accruing over time and how much each lender requires that you pay each month. Soon enough, we’ll find out how long it’ll take to pay it all off. That’s where online money tools come in. Find out which ones you really like the most. You might not refer back to these calculators more than once a month for a check-up (see below), but seeing your debt in numbers should give you a reality check of what you owe and what you can budget to pay them off early. I love unbury.us. It’s super basic but super helpful. Guys, it’s not a pretty site, but who cares? My favorite part is how you can see what your debt repayment will look like if you go with the “snowball” or “avalanche” methods. Pay off the smallest debt balance first, creating momentum in paying off those smaller debts sooner than later, and when they’re paid off, roll what was your monthly payment for that debt into the next smallest loan. This way, your total monthly cash flow toward your debt is staying the same, but you’re able to apply more to existing debt with the more loans you pay off. Unlike like the snowball method, you’re paying down the highest interest debt first, regardless of how large or small the balance is. You’ll save more on interest in the long run, but it’ll take longer to really feel like your loans are disappearing, since it’ll take longer to pay off a loan in full if the highest interest debt is also a high balance. But alas, you save on interest (that’s real dollars, yo!) in the long run. My student loans are through one servicer, but within that one loan is actually four separate loans, each with their own balance, interest rate and minimum monthly payment due. My total loan payment is $200/month, so the minimum monthly payment for each separate loan depends on how much gets applied to each from that $200 monthly payment. Label each of your loans separately in unbury.us, since you'll want to keep straight which loan balance is which. When I set out to pay off “Student Loan A” first (since it has the highest interest rate), I make sure I’m paying the correct loan when I go to my servicer’s website to submit that payment. This tip is all in an organizational effort, if you’re into that sort of thing. Adjust the monthly payment due. After you enter in all of the info for your loans, you can actually edit the amount of the monthly payment in the field below your data. This way, you can get a feel for how much paying an extra $50, $100, $200, etc., will affect your debt balances and projected total interest paid over the course of your repayment. It’s crazy to see how even a small adjustment can mean you’ll be DEBT FREE possibly even YEARS earlier. You can’t bookmark the Unbury.us page to save your info. You’ll actually need to save the WHOLE URL somewhere, so you don’t have to re-enter your info each time you want to do a check-up. I typically copy and paste my URL and email it to myself, that way I can access that info from anywhere. Old school, I know. This was my go-to for years. It’s a solid choice! It simply tells you how many months you have left until you’re debt-free. That’s some positive “prepayment” talk, right there, and I like it! 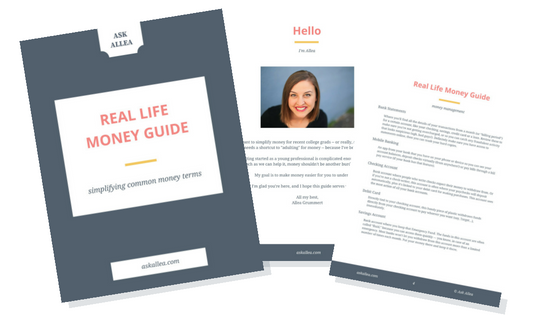 You can check out what it would mean for you to be debt-free in 3, 5, or even just 1 year. Check it out and see if it’s worth expediting your debt repayment plan. Now, if you’re like me, I like to see things happen. I like to know that progress is being made and that my hard work and planning aren’t all for naught. So, here’s what I suggest: get in the habit of doing a debt repayment check-up once a month. You’ll see how much you’re on track and watch your progress over the months really pay off as your loan balances go down and down and down until you owe them nothing more. Set your goals and WRITE THEM DOWN. Here’s what mine looks like from my plan earlier this year. I’m not far from making it happen! Track your progress each month. Make a note of your balance and how much you have left of each loan. Really, it’s just a log of your accounts, but how great it is to see those numbers go down! Endurance pays off. It’s not going to be an instant-gratification thing. It takes a while, but it’s worth it. That’s right. Celebrate your “wins.” Don’t go crazy and buy flights to Jamaica (unless you’ve budgeted and saved for that, then I’m all about it), but certainly give yourself a nice pat on the back. Perhaps buy a nice dress or some ice cream — to each her own. Trust me, I wish I had a magic wand to make all your debt go away, but that wand just doesn’t exist. Be reasonable with ourselves: it’s going to take time, effort, saying “no”, and also doing our best to maintain our sanity. Fear not, I’m in the same boat. Personally, I tend to balance a snowball and avalanche method. Once I commit to a plan, my goal is to stick with it. I’m going to pay off the smaller of two high-interest (same rate) student loans. It’ll only take me 3.5 months, so the light at the end of the tunnel isn’t very far. For me, I like seeing things happen, and though it’s 3.5 months, that’s practically instant gratification in the student-loan-paying world. That’s my plan, what’s yours?